Design, Fabrics, Sewing, Knitting, Crochet, Interiors and all things crafty..
Come and check out our guest post, and, of course, Karen's lovely blog! Mouthy Stitches received, FLOS ready to go! It so beautifully made, and big enough to fit a couple of projects in, plus scissors, small rulers, etc. Wendi did a great job stalking me, as I love gnomes, paperpiecing, texty fabrics and scrappy projects! I can't thank her enough for the effort she made, I LOVE it! I've also managed to finish my items for the For The Love of Solids Swap and will be posting them tomorrow. I made my partner a wall hanging based on Charley Harper's October Edibles print. I also made a smaller item, but I'm keeping that under wraps untill she receives her parcel. fingers crossed that she'll like it! Now I just have to catch up with my Piece Bee With You blocks and I'll be all up to date! This month I'm feeling the pressure, as two of the swaps I'm in are drawing to an end. The first is the Mouthy Stitches Swap, organised by Cindy, Hadley and Susan. For this swap we are to make a zippy pouch for our secret partner and fill it with yummy scraps of fabric. The idea is to "stalk" your partner via flickr, blogs etc, to get a good feel for what they might like. This is what I made for my partner...I have no idea if she'll like it as she seems to have dissapeared from the swap! The second swap I am doing is called For The Love of Solids, and I am really stumped on this one! There is some amzing talent in this swap and if truth be told I keep on second guessing myself and can't make up my mind what to do. I am going to make a wall hanging, which I've never done before, but the question is, what type? Modern, applique, artsy....too many choices! My partner, is an artsy girl with a love of nature, and I was toying with the idea of making a wall hanging inspired by the art of Charley Harper. I really need to get my skates on, as the deadline is drawing near!! Wish me luck! Finally, I also have to make February's block for the PIece Bee With You bee. This month's theme is aquatic creatures (of the tropical variety) and I still need to design my block and piece it together. By the way, I am loving this bee! 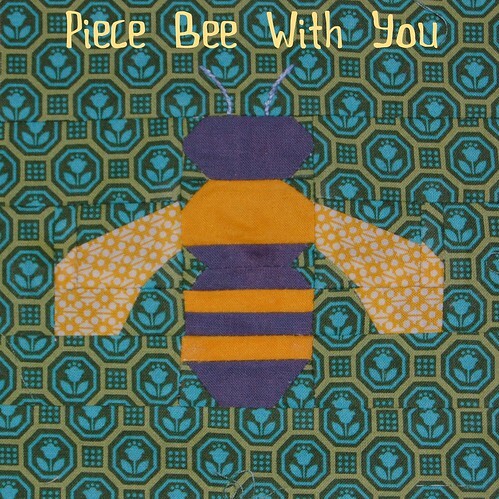 It is a paper piecing bee, with a different theme every month, and there have been some really cool blocks made. My months coming up in June, so I am still thinking about what I'd like as a theme. So maybe it's time to turn off the computer and start sewing! Calling all modern quilters in Ireland! The talented Sarah and Cindy have been working behind the scenes to launch a Modern Quilt Guild for Ireland. If you have a passion for modern fabrics and a modern aesthetic please go check it out! If you go to the website, you will find all sorts of information on modernquilting, there is a registration form, and this is your chance to make suggestions and offer your two cents! You can also find the MQG Ireland on facebook and flickr. Anyone is welcome to join, even if you are a complete novice! And don't forget that there are two other fabulous organizations for quilters in Ireland, have a look at the Irish Patchwork Society, and The Quilter's Guild of Ireland. I love the Echino Story fabric so much that I use it sparingly, across a number of projects. For this project, I am using a remnant of grey wool and a fat quarter of Echino story in an Autumn colourway. I am just using one vertical section of this patchwork style fabric for the front of the cushion, and a horizontal strip to hem the envelope of the cushion. Sew the three panels together to make the front of the cushion. Hem the two backs pieces, using the echino strip to add a splash of colour on the grey wool. When the front is sewn together, I try a little machine embroidery, to extend the orange branches onto the grey. And voilá... an easy, peasy cushion and some left overs from my Fat Quarter for some more Echino inspired projects. Well, it's been a busy week getting everything moved and setting up the new space. We are almost done and will be posting photos soon. But, first things first, we want to get our class schedule up for the next couple of months. We will be adding the workshops to the website over the next week and you will be able to book online. In the meantime, you can send us an email if you are interested in booking a class. Our phone line should be up and running by the end of the week (We kept the same number, 091 566972). Unless otherwise stated you should bring your sewing machine with you, if you do not have a machine and need to borrow one, please let us know in advance. All children's classes are hand-sewing. BYO Sewing machine with all attachments as well as the manual if you have it. All other materials will be provided. Class limited to 5 people. This is a full day class in which we will draft a pattern to your measurements and make a skirt to fit perfectly. This class requires intermediate sewing skills. You can purchase your fabrics on the day or you can bring your own, in which case you will need approx 1.5 mtrs of cotton fabric, a matching thread and a 7inch zipper. See above for class description. 11am Make a lined Tote Bag €25 (materials not included): In this class you will learn how to make a lined tote bag, with interior pocket. With instructions to make more when at home. You can purchase your fabric on the day or you can bring your own, in which case you will need approx 0.5 mtrs of heavy cotton or linen fabric and matching thread. 2pm Applique Bunting Workshop €25: This workshop will show you the techniques needed to make lettered bunting that you can then button together to spell names and messages. You will be doing applique and buttonholes. You will be provided with pattern pieces to take home with you to continue your bunting at home, as well as your work completed in class. We will be making a detailed cushion cover using machine applique techniques. You will go home with a completed cushion cover, plus pillow form. All materials are included in the class. This is a full day workshop, in which you will be making the popular Anna Tunic, by Amy Butler. You can purchase your fabrics on the day or you can bring your own, in which case you will need approx 2 mtrs of cotton fabric, and matching thread. Wednesday 22nd February 6:30pm - Crochet for Absolute Begginers €60 for 4weeks. All materials included. This class will run for 4 weeks from 6:30 to 8pm on Wednesday evenings. Class dates are the 22nd and 29th of February, and the 7th and 14th of March. 1 hour class for younger children who are interested in sewing. An all-day class to show you how to confidently make a roman blind. or make one for your window measurements. Using the random generator, belive it or not the winning comment is number 1. It does happen! Oh, the buttons are really cute, the fabrics too of course. Winter, huh? I don't envy you, although it's been raining here, so not great either. Vicky we will be sending you an e-mail to get your details! We are joining in on Sew, Mama, Sew's winter Giveaway Day. This is definitely worth checking out, as there are tons of blogs and shops world wide giving away the coolest stuff, from supplies to handmade items! And you have a few days to browse through all the entrants. A great chance to discover some new blogs and the amazing talent available on the world wibe web! We are giving away, three fat quarters of lovely Japanese fabrics, a pack of " Cute as a Button" East of India Star buttons, and a set of cute Japanese buttons. To be in with a chance to win, leave a comment on this post. For a second chance, like us on facebook, and come back to let us know you've done it. The winner will be picked at random at the end of the Giveaway. And we do post internationally so all are welcome!! I am participating in the goodie swap hosted by Cindy at Fluffy Sheep Quilting. It's my first time doing a swap, so I'm a little nervous.We are swapping a mugrug and small project with two people and as partners are secret you have to do a good bit of snooping to find their likes and dislikes! Here's the mosaic I put together for my likes. There really is some amazing talent out there and I hope I'm able to make something as lovely as these for my partners, but to their taste, of course! Click on the picture to see who made what! Japanese Fabric Swap: The end result! I was delighted today when I came in to the shop and found that Cindy had left in the charm pack from the Japanese Fabric Swap. All the fabrics were lovely and I can't wait to get stuck in! This was my first swap and it was a lovely experience. A big thankyou to Cindy from Fluffy Sheep Quilting for organizing the swap, and to all the lovely ladies who participated. Here's a peek at all the squares!